I cannot believe the Race is 1 week away. All the planning and coordinating is coming to the close for another year. August 5th, we will have a 5k family run/walk. This is a non competitive race designed to get people out and moving. In addition to the race we have over 60 silent auction items as well and food. Violet would really like to get an outdoor swing, a bouncy seat and a new floor sitter for daddy’s house. We will also be selling previous shirts and new shirts as well as VioletsVoice bracelets. Violet is in her wheelchair a fair amount of the day because of feedings and school. 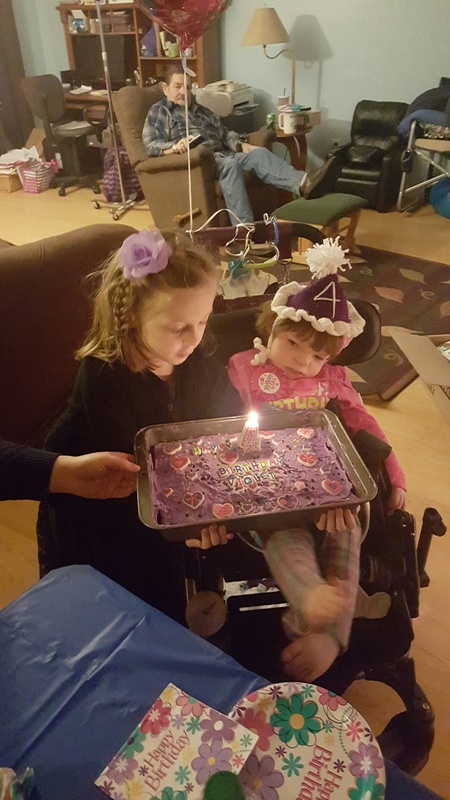 Would you consider supporting Violet in attending the race or sending a donation? Thank you all for your love and support for sweet Violet. Violet had her surgery at the end of January. We spent one night in the ICU to make sure her pain stayed until control she could tolerate her feedings and she didn’t have any bleeding post operatively. Violet did surprisingly well, although she wanted to be held and kept upright so we came home Friday. She started doing a lot of coughing Saturday and Sunday. By Monday she was starting to cough out some secretions. Throughout the weekend and even on Monday I was calling the surgeons to make sure everything was still normal. Violet also wasn’t tolerating her feeds. I decided to do a slow continuous feed. Stopping formula and doing pedialyte and water. Wednesday we went into the doctor and Violet had pneumonia. Once on medication she recovered very well from the surgery and has been doing well since. Recently she started suffering from her seasonal allergies so I am trying to combat that right now. Violet will be having her tonsils and adenoids removed on the 21st. What’s a simple procedure for most kids brings me anxiety. We will be admitted to the ICU post operatively. I have some serious anxiety about how she will be post op. How will we manage pain? How will we know if she is in pain? What if she starts bleeding? What about when she gets home? From my previous work history I used to get kids on the short stay floor after a simple T&A ( tonsil and adenoidectomy) and we encourage soft, cold food and well, Violet won’t be able to do that…so…how does this work? I’m so grateful we have a conservative surgeon who knows Violet. Knows that Violet doesn’t play by any rules and needs to be treated than other children. But for now, I will embrace Violets snuggles and giggles and hope that all goes better than planned. Where has time gone? How is it this little girl as turned 4 already? She never seems to amaze me. At 4. What does she love? Dancing. Singing. Snuggles. Baby dolls of course. She got this one for her birthday and instantly fell in love! Now she has her baby, Gracella (her big sister might have named it for her). 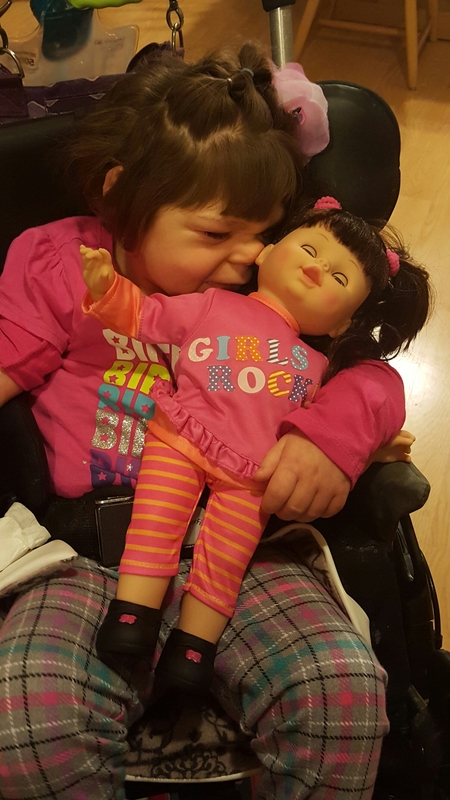 But just like every little girl, she loves her “Big” her family, her caregivers and her baby doll. We were discussing how long we will call Violet, “Baby Violet”…well…probably forever…lol. Her characteristics are not of a baby anymore. She is becoming a little girl. Looks and interests. So what has been going on with Violet? In September we had a round of routine appointment that went well. We have regular 60 to year follow ups. We also had a consult with the developmental pediatrician. Who referred us for a sleep study to help get some answers for Violets sleep issues. The eye doctor also made the recommendation for Violet to go to UW Health in Madison to get a more intensive eye exam, VEP. This will help us have a better understanding of how Violets brain processes what she sees. Violet recently has some struggles with an infection in her belly that we are finally over. It lead to a lot of abdominal pain and discomfort resulting in a very irritable girl and even more sleepless nights. Violet underwent her sleep study this past Monday. As much as I’d prefer not to, we will started Violet on a new medication to help her relax (this will replace the previously given Benadryl and pain meds) and then have increased her med that we used to help her sty asleep. So far we are 2 for 2 in sleeping through the night. Let me tell you it is amazing what some sleep with do for a mama! Violet has been diagnosed with mild sleep apnea which we will be seeing ENT for to see if she would benefit from having her tonsils and adenoids removed. I am not really interested in going through the process of another surgery but I also want to make sure that Violet is in the best health and has the best options for sleep and health. Violet has started school this fall also. She has been making some amazing gains developmental gains. She is starting to walk more in her gait trainer, she is interacting more and making choices. Recently when in the gait trainer a consultant we have working with Violet & the EC (early childhood) staff asked if they always opened the door for Violet to walk through and they said, yes. Heidi asked what would happen if they shut the door, if Violet would react. React she did from the story I heard. Apparently she got quite mad until they opened the door and then she walked through it. I LOVE IT!!!! Violets response to this is HUGE!!! She is also responding to people who she sees on a regular basis and “hides” when she doesn’t want to do what you are suggesting. Violet is growing like a weed and is such a funny little girl. She is getting a little sad the weather is changing and it ‘s getting cooler outside and she will not be able to spend as much time outside as she has. Someday my plan is to build a sunroom for her that is surrounded by windows giving her the ability to “feel” like she is outside even when we are inside and somehow have it always nice and warm for her so she can enjoy being out side all year long. She is looking forward to getting her new bed that way when she plays in her bed after s wakes she can fit and not get stuck. I think that’s the quick update for now. I’ll do my best to update sooner. Life has just been crazy and so often I update this in my head but never really get it on the computer.